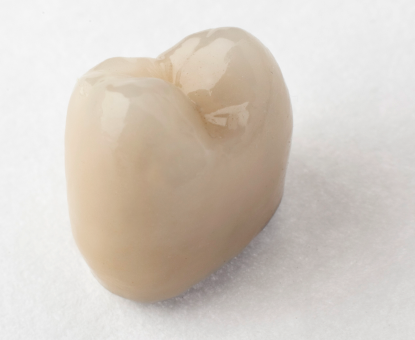 Porcelain fused to metal crowns are the most traditional crown and bridge restoration. They have been used in the industry for several decades therefore have been tested to perform in terms of strength, reliability and functionality. The porcelain fused to metal crown offers great aesthetics which provides a very attractive natural tooth like appearance. The substructure of the porcelain fused to metal crown is designed using our state of the art CAD/CAM facilities allowing for a precise, accurate fit for any type of preparation. Porcelain Fused to Metal has the advantage of flexibility as they can be used on both anterior / posterior restorations and is versatile for any number of restorations.